New research proves that the brain can achieve stable motor memories in association with a prosthetic device. It establishes that use of artificial limbs or other devices can become intuitive. "When your own body performs motor tasks repeatedly, the movements become almost automatic," said study principal investigator Jose Carmena, a UC Berkeley assistant professor with joint appointments in the Department of Electrical Engineering and Computer Sciences, the Helen Wills Neuroscience Institute, and the Program in Cognitive Science. "The profound part of our study is that this is all happening with something that is not part of one's own body. We have demonstrated that the brain is able to form a motor memory to control a disembodied device in a way that mirrors how it controls its own body. That has never been shown before." In the experiment, which involved having monkeys learn to control the movement of a cursor on a screen, researchers used a "decoder" paired with a stable group of neurons. 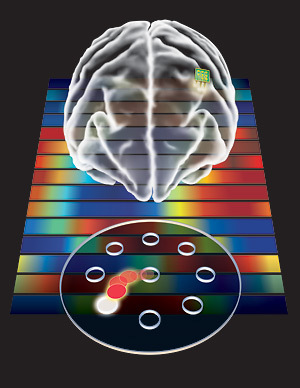 The decoder translated the signals from the brain's motor cortex into movement of the cursor. As the tasks were being completed, the researches were able to monitor the changes in activity of individual neurons involved in controlling the cursor. They could tell which cells were firing when the cursor moved in specific directions. The researchers noticed that when the animals became proficient at the task, the neural patterns involved in the "solution" stabilized. In his (still marvelous) 1968 novel Babel-17, Samuel R. Delany writes about a future in which all manner of decorative implants were available. It is assumed that the brain is able to create a mental representation of the artificial implanted device, in order to manipulate it. Hyperspace ship pilots had elaborately implanted bodies; they would wrestle each other in an elaborate antigravity arena to show off their mastery of their different parts. "You can really judge a pilot by watching him wrestle?" the officer inquired of Rydra. She nodded. "In the ship, the pilot's nervous system is connected directly with the controls. The whole hyperstasis transit consists of him literally wrestling the stasis shifts. You judge by his reflexes, his ability to control his artificial body. An experienced Transporter can tell exactly how he'll work with hyperstasis currents." Via UC Berkeley press release.